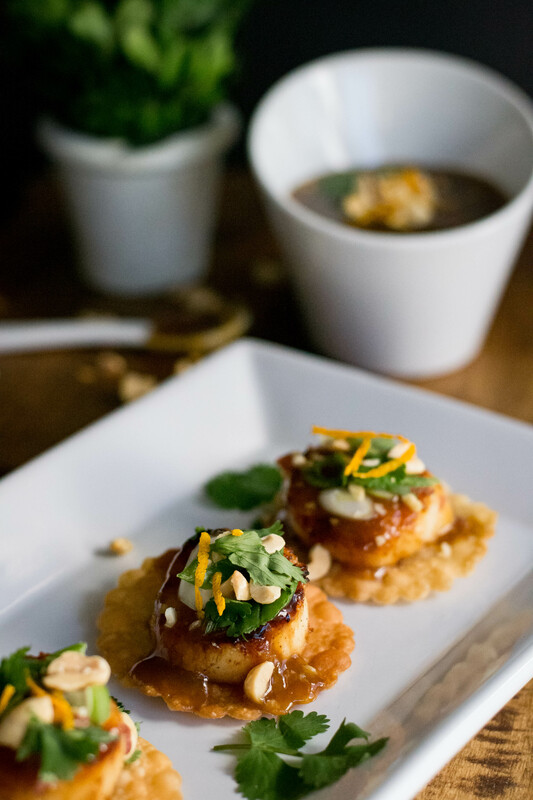 Garlic Ginger Orange Scallop Wontons - What the Forks for Dinner? In the world of seafood shrimp, scallops and lobster are my top three. As I have mentioned in many a post, my best inspiration for recipes come from trips to the grocery store. A couple of weeks ago I was running into the store for just one thing. LOL. Upon entering the store, I almost fell over a fantastic seafood display. If it was seafood, it was on this display. Two items caught my eye, small lobster tails for $5.99 each, and the most beautiful large sea scallops. I bought both. Immediately I knew what I wanted to do with the lobster tails, and you won’t be disappointed in what I made, the scallops, on the other hand, I pondered over. 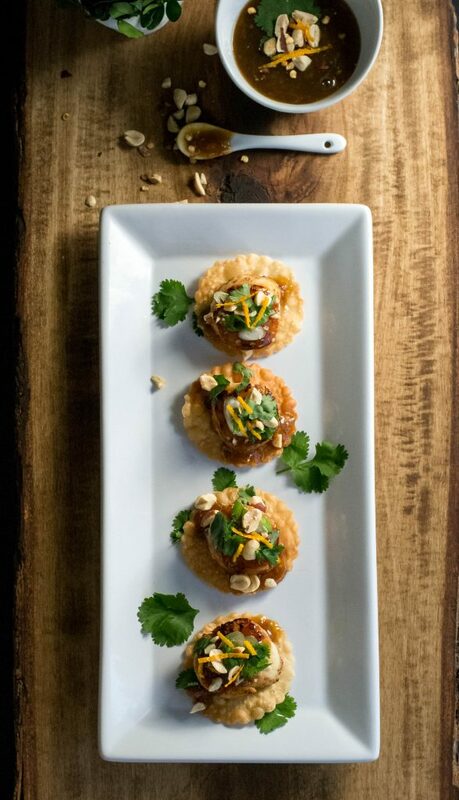 With Holiday parties shortly on the calendar, I knew an appetizer recipe was just what I needed. 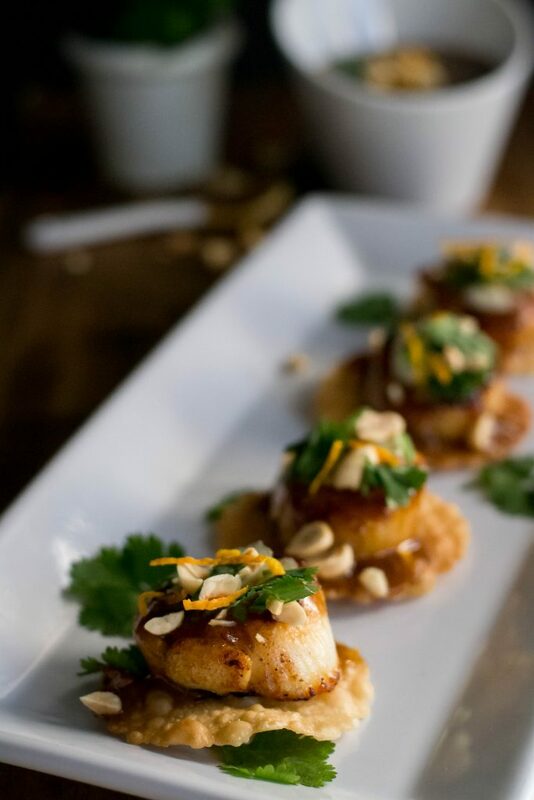 Scallops lend themselves to many flavors, and although Tim is not a fan of Asian food, I adore it. Orange Sauce is one of my favorites, and I had a few oranges leftover from Thanksgiving, so it was a start. Asian sauces typically have soy, ginger, and garlic, so who am I to buck the system? A pinch of red pepper flakes so Tim would have his spice and a bit of lime juice for acid. To ensure a nice sear, as scallops cook quickly, I sprinkle them with just a touch of sugar. This caramelizes the scallops without overcooking them. Wonton wrappers fried golden crisp make a perfect plate for those sweet, delicious scallops, drizzled with a spicy-sweet orange sauce. 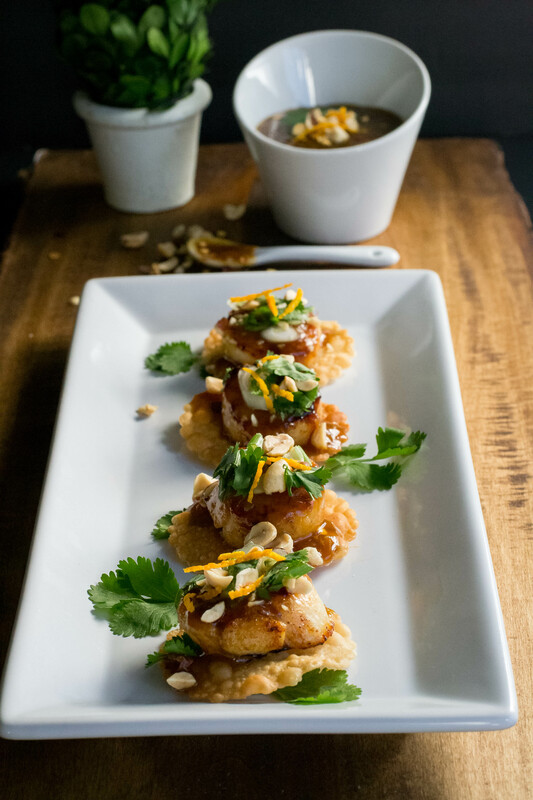 Garnish with orange zest, green onions, cilantro, and peanuts. 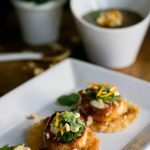 Garlic Ginger Orange Scallop Wontons will be the best little two-bite appetizer at your Holiday Party! Cut wonton wrappers into circles slightly larger than the size of your scallops. Heat about 1 inch of oil in a heavy bottomed saute pan and heat over medium-high heat until hot. Fry wonton wrapper until crisp, remove from oil to paper toweling to drain and cool. Set aside. Pat scallops as dry as possible with paper toweling and set aside. Combine lime juice, orange juice, soy sauce, sugar, ginger, garlic, and red pepper flakes in a small saucepan. Bring mixture to a boil. In a small cup mix cornstarch and water, mixing thoroughly. Add cornstarch mixture to the boiling sauce and stir until sauce thickens. Remove sauce from heat and set aside. Heat avocado oil in heavy bottomed sauté pan over medium to medium-high heat. Add scallops and cook 2-3 minutes on each side until browned and cooked through. Place scallops on reserved wonton wrappers, one scallop per wonton. 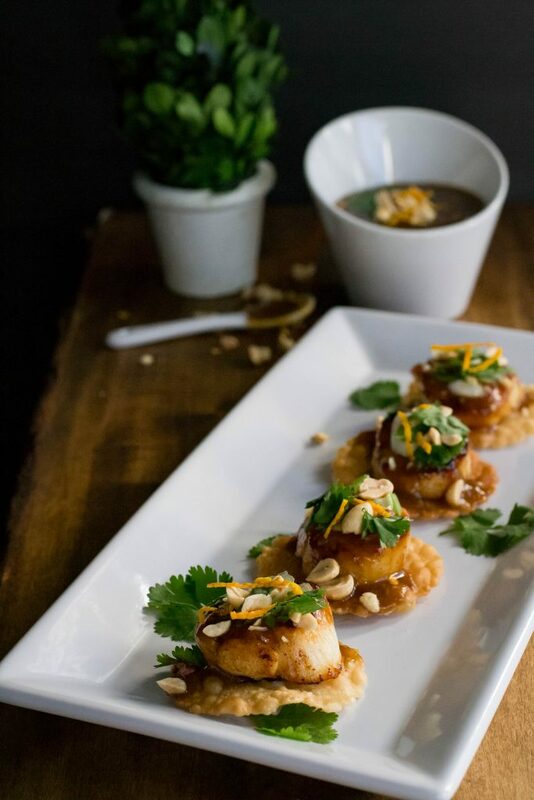 Spoon sauce over scallops and garnish with chopped green, orange zest, cilantro, and chopped peanuts as desired. Serve immediately with extra sauce on the side.